The flavors of lemon and olive oil are like a fixed set of ingredients in a dressing and that's exactly what you will find in this Lemon Oil. The olive oil is cold pressed and the addition of the lemons (it takes 2 to make an 8.4 oz. bottle of Lemon Oil), means that you don't really have to do much more than may be add salt and pepper and just a few drops of lemon juice to have your perfect salad dressing. Recommended uses are basically any recipe that calls for lemon peel or zest. 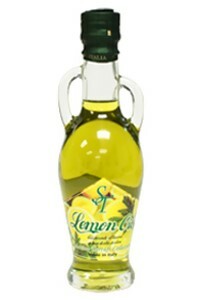 The award-winning oil can be used in a variety of dishes, ranging from fish to salads to poultry.